Chicago is.... my kind of town! 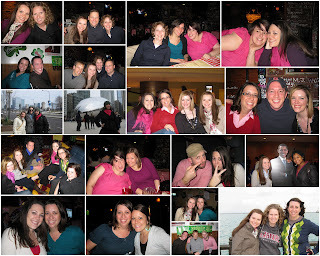 Earlier this month (right before finals actually), I headed to the Windy City to enjoy time with my old Baylor Cohort and attend the 2010 NASPA (student affairs administrators) conference. I was so excited for this visit, even though school was kind of stressing me out (all of my assignments seemed to be due leading up to the conference and right after it ended). Candice, Matt and I had been collaborating on this visit for a long time. Matt and I knew that to convince Candice to come back to the US for the conference, we'd have to make it worth her while, so Matt invited us down to his place in St. Louis for the weekend following the conference. But I'm getting ahead of myself! I woke up early on a Saturday morning, threw on some clothes, grabbed my huge bag and headed to LAX. Candice had flown in on Friday to get a start on jet-lag-management (seriously, Candice came to us from ENGLAND! that = awesome), and Kathryn (our other roommate) was headed in Saturday also. We were excited to see each other after a long time apart, and were also looking forward to connecting with some of our other cohort-mates who happened to already be in town! I don't want to bore you with the gory details of everything that happened except to say that it was a TERRIFIC time. We sang Karaoke (Kathryn, Jonathan and I rocked the bar with our rendition of "Love Shack"), had a cohort reunion over deep dish pizza at Gino's East where I think we were the loudest group in the entire restaurant (and Candice, Kathryn and I walked almost a mile only to find out we were at the wrong location...), heard Condoleeza Rice speak (she was a really great speaker), went to a few sessions, presented a workshop on Campus Spiritual Climate (with Matt - which we think was a success), and shared a lot of laughs and memories over a lot of wine and beer. On Wednesday evening, Candice, Shannon and I joined Matt and a few of his coworkers on the Amtrak to St. Louis. It was really fun to take the train somewhere and inspired me to take the train to other locations as I have the chance. While its not faster than driving, it is certainly easier and cheaper, the seats are way more spacious than on a plane, and they have electric outlets so you can use your computer without worrying about a dead battery. 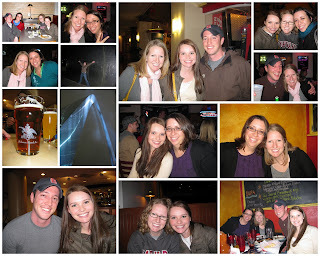 While in St. Louis, we explored Forest Park, visited the Arch, enjoyed thin crust pizza, did some shopping, stayed up till all hours of the night, and did a lot of laughing. OH, and Shannon and I sang Karaoke ("Ain't no Mountain High Enough"). All in all, it was a grrrreat work and vacation time, and I was so grateful for the opportunity! Hunter's Moon by Dan Hoesel is not your normal "Christian Fiction." First, aside from Frank Peretti, most of the Christian fiction I see around is romance-novel-ish. I love mysteries, and action stories, though, so I thought this book would be right up my alley. And indeed, it did have a good mystery, a lot of tension, and a fairly exciting ending. But I'm getting ahead of myself. C.J. is a novelist who, despite his efforts, cannot keep his hometown of Adelia out of his books. There is only one problem... some people may not want their histories shared with the world. When C.J. returns to Adelia to attend his grandfather's funeral, he finds himself confronted with a family secret he ran away from, and a number of family members who are and aren't happy to see him. C.J. 's brother, Graham, is running for senate, and meanwhile C.J. 's messy divorce and other family happenings are sort of mucking up the plan. All the while, C.J. is rediscovering who he is and who God is calling him to be. Here is the bottom line: this book wasn't half bad. I thought there were too many characters right off the bat, and too many with similar names which made it hard for me to keep them straight (George and Graham for instance). That and the fact that the mysterious family secret was revealed pretty early in the story were my only "cons". I thought the author did a really good job of presenting C.J. 's young faith in Jesus without being super preachy but still being authentic to the character and to Christianity. The story did meander a little bit, but I was engaged in C.J. 's life, so it was actually OK. And the end kept me up past midnight because I didn't want to go to bed without finishing it, which if nothing else at least shows that the book had caught me pretty well by then. 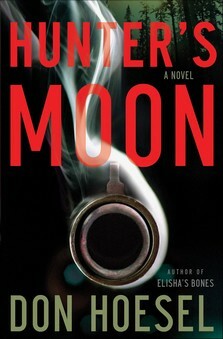 Hunter's Moon is a pretty solid read, not great, not the best book I've read in a while, but good. If you like mysteries and suspense, you'll probably like it. 4 scarecrows out of 5. Thanks for putting up with my continual book review posts, friends. It just so happened that my receipt of three books from Bethany House coincided with my travels across the US and my spring break - which meant there was going to be a LOT of reading time in my future. And since my only obligation in return for getting these books is to write a review, well.... you've seen a lot of them lately. 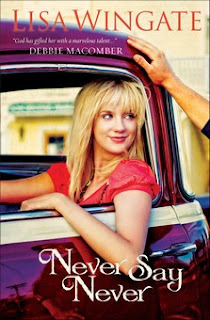 On the bright side, "Never Say Never" by Lisa Wingate is hands down the BEST of the books I've read in the last month or so. The characters were so engaging and charming, the story so touching and entertaining, and the setting so enjoyable that I read it in 24 hours. The story centers around two women, Kai, a young gal who works on a cruise ship and makes jewelry from found objects and Donetta, and older lady, who with her two best friends is headed to Perdida, Texas to enjoy a cruise. But before they can make it to Perdida, a hurricane moves in and causes an evacuation of Kai and the rest of the gulf coast. Donetta, her friends, Lucy and Imogene, and Kai end up traveling together after series of the kinds of crises that happen during a hurricane evacuation. Through their travels together on the road, and Kai's eventual landing in Daily, Texas (Donetta's hometown) - all involved learn about themselves and others. Kai and Donetta alternate narrating the chapters, and so you hear both of their perspectives, often on different events that are happening - and it makes the story really entertaining. As you learn about Kai's family history, you understand more about her reticence to find a home in Daily - even with the handsome Kemp Eldridge (Donetta's nephew, and the high school Baseball Coach) on her tail. And as you learn about Donetta's relationship with her husband (who is missing when she returns to Daily), you really get a sense of how miscommunications can happen within marriages. As I read the story, I chuckled out loud a lot; I also got teary-eyed a number of times. Lisa Wingate is a great storyteller - and it didn't hurt that Daily is located near Waco/Killeen, so the way the characters talk (they say things like "might could" and eat Chicken Spaghetti) was super familiar and accurate and the areas that she was talking about reminded me so much of my years in Texas. If you enjoy fiction novels, and especially if you like romance stories - you will really love this one. For real people, buy this book. Five Small Town Baseball Fields out of Five. Here is a hilarious short video (3minutes) that you'll love. It is called "Academy Award Winning Movie Trailer" and essentially spoofs all the cliche movie scenes that you see in virtually every movie the last few years. Enjoy! "Beguiled" by Deeanne Gist and J. Mark Bertrand is the story of Rylee Monroe, a dogwalker in Charleston, South Carolina, burglaries that are happening in the homes of her clients, and the mystery surrounding the loss of her parents. When the story of the burglaries catches the eye of a local journalist, Logan Woods, life begins to get really exciting for all involved. This story has some great elements and some lackluster ones. The story arc in general, is interesting and exciting. The hero is appealing and fun and the heroine - while not the most fully formed woman in history - is a pretty good character, too. Although I did figure out the mystery just before the authors revealed it, the mystery aspect of the story was strong. Additionally, and this was important to me, I didn't really notice a clear voice of either author, it felt as though it was written by one person - which was a welcome relief. On the other hand, I thought some of the elements - like how the dogwalker takes her dog out all over Charleston on her rollerblades, wearing tiny cutoffs was sort of bizarre. And I felt like she was often kind of "simpy" as my mom would say - a sort of melancholy character. The book is slow to get started, but once it gets going it is a quick read and certainly kept me content on my flights from LA to Chicago and then from St. Louis to LA. Because this book is from Bethany House, there are some elements of faith included in the book. In general however, I felt like the faith elements (e.g. prayer before a meal, crisis-type reckoning with God, church community) were really naturally woven into the story. Sometimes in "Christian fiction" the faith elements are sort of overwhelming and feel kind of false, but in this case, I think the authors were authentic in their portrayal of the characters' inner lives. I really appreciated that part of it. I give Beguiled three toy poodles out of five. Good mystery, not the best I've ever read, but good. Check it out. I love Jane Austen. A couple summers ago, I set out to read all of her books in one summer – even those I had read before (Pride and Prejudice and Sense and Sensibility). Even after realizing that many of her characters and stories are similar, I still loved her. I love the way she writes with wit and intelligence. And I really enjoy how everyone who deserves to be happy in the end does indeed end up happy. Sense and Sensibility, for those of you who haven’t ever read it or seen one of the many film versions, is the story of two sisters, Elinor and Marianne who are both alike in passion, except that Marianne is all passion and impulsivity on the outside (sensibility) and Elinor is all composure and caution on the outside (sense). The story tells of secret love, not so secret love, lost fortunes and selfishness, and deep sisterly love. This story, even more than Pride and Prejudice, makes me wish I had a sister or two. This insight edition is different from other more “academic” versions of classic works, because rather than pages and pages of footnotes instructing the reader as to the socio-historical background of the book…. Well, it’s like the editors are reading the book with you. Occasionally there are informative footnotes which tell you what a “Barouche” is (a four-wheeled carriage pulled by 2 horses that seated four people), or tells you about “Harley Street” (a street in London populated chiefly by medical professionals). But there are also 6 other types of footnotes that occur throughout the book – usually as an “aside” on the edge of the page – including notes about Jane Austen’s life and how a part of the story relates to it, references to S&S in film and television, themes related to faith, and notes on characters that the editors dislike throughout the story. While at first, I thought that this tongue-in-cheek note system was a little distracting, as I went onward, I began to enjoy the voices of these women. It was kind of like I was reading the book with a friend or with a book club. So that as I read about something really horrible that Fanny said to John or Lucy said to Elinor and thought, “UGH! I think Fanny is such a jerk!” there was the comment by my “friends” in the margin saying the same thing. 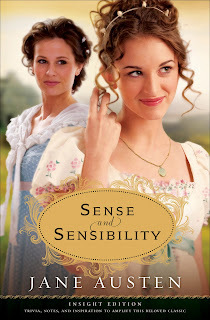 This version of Sense and Sensibility does not add anything new to the text that Jane Austen wrote, and thus the story of course is great. The Insight Edition does add some contemporary fun to the novel however, and it is likely you would also enjoy taking these friends with you on the journey through 19th century England. * My thoughts on "Slumdog Millionaire" which I am finally going to get to watch sometime soon. * My thoughts on "Survivor: Heroes vs. Villians", stereotypes, and how we conform or rebel against our labels. * My work on the Campus Programs Committee and what I've learned about allocating funds, helping student orgs, and being caught between my role as a student and administrator. * My various travels - complete with pictures - and including a recap of the presentation that me and my friend Matt are giving next Tuesday at the NASPA conference. * Life in general, of course. Finally, check out the weight loss tickers to the right! I have reached my first "milestone" - 5 pounds lost! Hooray!! I am 1/2way to my first goal of losing 11 pounds, and 1/7 of the way to my goal for 2010 of losing 35 pounds. Please be praying for me that I can make wise decisions about exercise and food choices while I travel. I am not known for moderation on the road but I want to keep up my good progress!